Are you thinking about taking your car out for a drive today? Unfortunately, we want to point out that sometimes the roads are not as safe as they should be, and that brings us to today’s optical illusion. 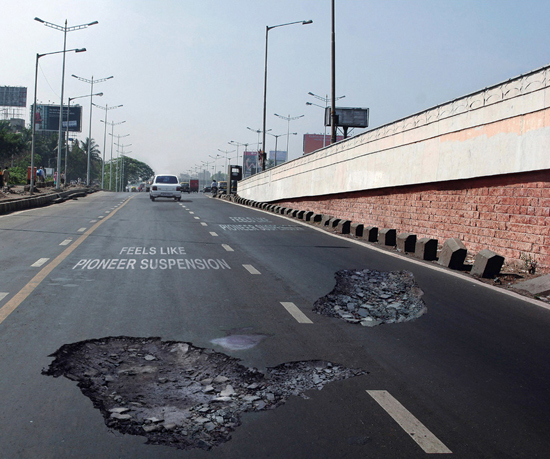 Take a look at these huge holes in the road, and what do you think that is going to do to a two pairs of tires? The road with holes in it can really do damage to both a car and its tires too, and we think you all should really be careful when you drive. However, do you all know that these holes are not real, but just a clever way to advertise? Ready for an illusion that may freak you all out to the point where you never eat popcorn again? Check out this popcorn illusion, and you may notice that these pieces of popcorn look like interesting things like skulls. What do you all think of this? Does it make you want to eat popcorn or stay away from it? You all may never want to get near popcorn again after seeing this illusion, and we certainly do not blame you for that. Have a nice and peaceful Sunday, and we will talk to you all again tomorrow. Here in Brasil we dont need illusion, we havê in 3d.